Top 1% EPD in 6 categories !! 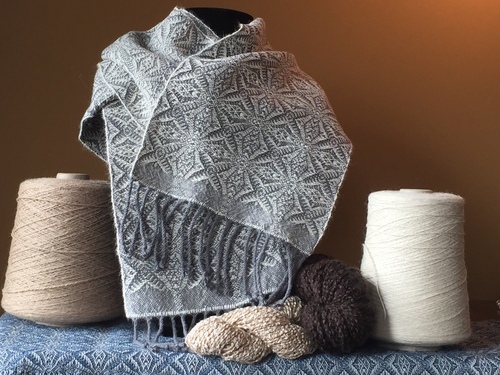 Silver Threads produces handwoven creations steeped in the heritage of the farm life lived in bygone years, when much of your clothing and homegoods were made from what was raised in the community. Well, we are recreating a bit of that right here on our farm. My husband and I have been alpaca ranchers for nine years. Much of that time has been spent right here in Lagrange. We actively breed, birth and raise alpacas for sale, and use their incomparable fleece in many ways. Shorn once a year, each animal can produce between five and twelve pounds of useable fiber. That quickly adds up to a lot of bags of fleece (remember Baa Baa Black Sheep). So, now there is yarn. Yea! What do you do with all that? Well you sell some of course. But then you get curious. So we bought a loom, and took a lesson and have been weaving ever since. Then comes the dying and next the spinning. It’s an addiction, an obsession, but a good one. 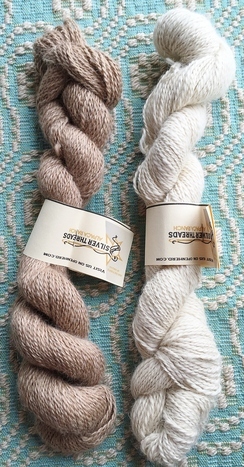 Silver Threads raises Suri alpaca and most of the product you see is just that. Our annual harvest is upwards of 200 lbs. We belong to a National Fiber Cooperative and employ a number of mini mills and a hand spinner or two to help us transform our raw fiber into the yarn that we use in our weaving. 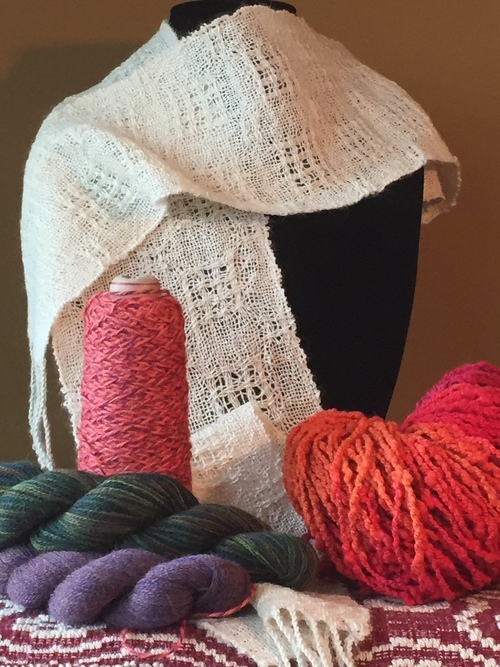 The fiber Co-Op, uses our graded fleece along with other graded fiber from farmers like us to produce beautiful yarns with fantastical combinations which is used in our weaving as well. Generally, we use alpaca in all of our work, and much of it is from our own herd. In fact, I can probably tell you which of our wonderful animals contributed their precious fleece to each project. But then again, the joy of being a fiber junky; I am not above acquiring something special to use in our yarn or with our yarn, or as our yarn. If you would want to know more about the piece you are considering, just ask. 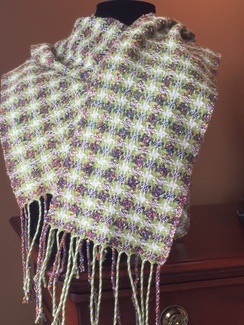 I have been showing and selling my weaving and yarn at alpaca related venues, do occasionally take custom orders and am a member of the Louisville Area Fiber Artist Group, through which one of my wall art pieces was accepted as part of a charitable donation to hang in the Louisville Child Advocacy Center. 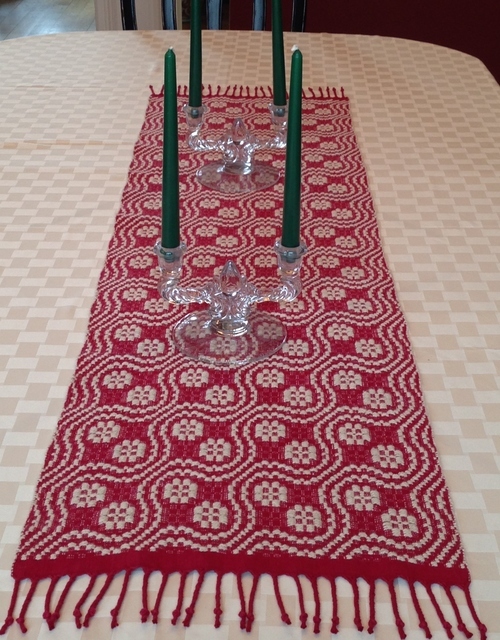 We currently have four lines of weaving. 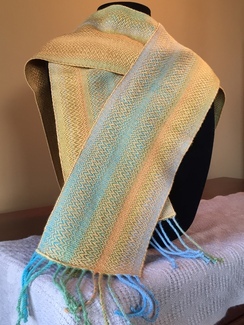 The first is Rustic Revisited, which looks relaxed, sometimes random and incorporates alpaca and art yarn of various kinds to create a casual line of handwoven scarves and shawls for everyday use. 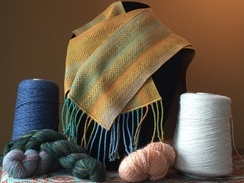 Homespun Homage calls on old time weave structures, but updated, using alpaca in place of more customary fiber, such as wool. This line combines alpaca in conjunction with other modern materials, such as cotton and tencel to bring beauty and utility to table runners, placemats and pillows. Almost Artsy combines dyed alpaca with beautiful colors and patterns, sometimes alone, sometimes milled or woven with other fiber such as bamboo and silk to bring out the best in the scarf or shawl.